On the same day that the BBC announce tomorrow’s launch of version 2 of the iPlayer, comScore release some details of where UK internet viewers are watching their videos. Despite all the whinging from the ISPs, the BBC is a distant second to Google’s collection of video sites, both in terms of the number of videos watched and the number of unique users, unfortunately they don’t compare the number of hours watched (the BBC programmes are likely to be a lot longer…and in the whinging ISPs defense, higher quality). What is particularly interesting is that neither 4OD or ITV’s catch up service even make it on the top ten list. Reiterating the point I made when the BBC were criticised for over-spending on their online services: The BBC is not competing with commercial UK companies. Rather than criticising the BBCs spending, other content providers should be looking for ways of working with the BBC. Whilst the elusive project Kangaroo will help create an online presence for the traditional TV viewer, it is probably not enough. People have changed the way they watch video, they are now seemingly watching shorter videos as they click through sites like YouTube. The traditional providers need to find ways of getting part of that market. Whilst attempts are made to make short clips available, it tends to be with a top-down approach, rather than giving the users the free reign that they want. Obviously such free reign is difficult as the BBC, Channel 4, and ITV work within copyright rules, whereas YouTube takes a more laissez-faire approach. As I never tire from saying, I am huge fan of the BBC. Therefore I was pleased to note last week that they were trialling access to their archive, and unlike previous trials, I was quick enough off the mark to get accepted as part of the trial. This morning my password arrived. 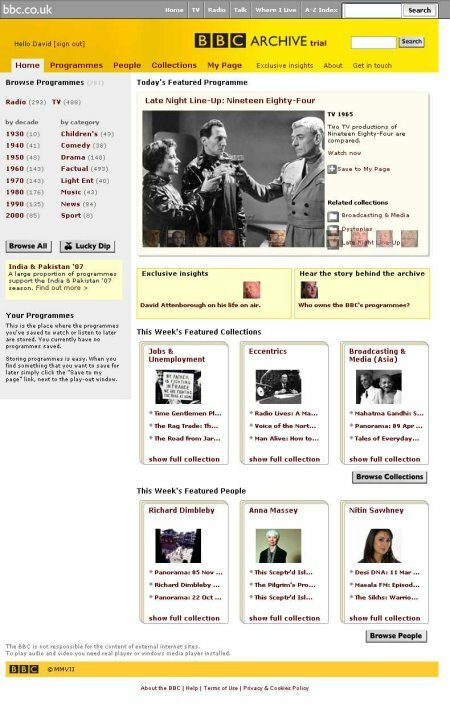 Currently the archive provides streaming access to 781 programmes, 488 television programmes and 293 radio programmes, with the promise of more being added all the time. Whilst the streaming quality is not as good as the iPlayer video, it will no doubt placate the ISPs and Apple users who have been complaining about the iPlayer. Whilst 781 programmes is a drop in the ocean that is the BBC archive, it is nonetheless a very broad selection of programmes, and is likely to appeal to vast swathes of the public. From those who wish to take a nostalgic trip down memory lane, to researchers who are interested in the changing attitudes of the British public. The only annoying aspect is that there are generally one or two episodes of any particular programme, whilst this is likely to change in the future as more programmes are added, that’s not much solace for someone who has just watched the first episode of The History Man, and is waiting for part two! But who couldn’t be forgiving with a 1970 episode of the Basil Brush show to look forward to?